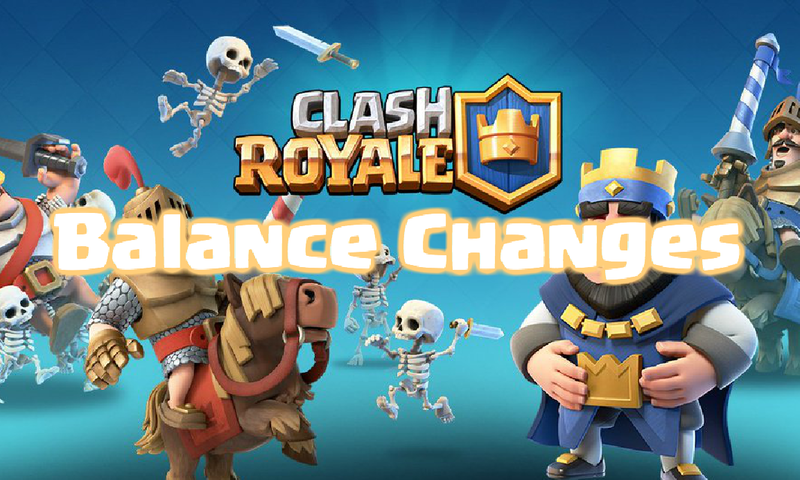 The newest round of balance changes are here in Clash Royale and this balance changes update features the royal giant and elite barbarians getting nerfed! These balance changes for Clash Royale will be coming April 19th, 2017! The nerfs are the real story behind this set of balance changes! You have 5 of the most popular cards being nerfed in the RG, EBs, furnace, EW, and skarmy. Royal giant got a good nerf: I think deploy time will help be able to counter it more than a HP or damage nerf. Elite barbarians definitely needed a solid nerf and I think they got one in their HP reductions. Also, having the first attack come slower will help with timing of defensive troops. Furnace will be more vulnerable to spell damage with its HP reduction. The e-wiz also got a reduction, but with its hit speed. Electro wizard was starting to feel a bit overpowered, so this might tone him back a bit. Also balloon damage was changed to be more consistent with the giant skeleton. Lastly, the skeleton army got a skeleton nerf, which seems like a bit much to me. Skarmy seemed overall pretty balanced. We had only three buffs in the April balance changes but they are important. The goblin hut has really fallen behind to the furnace, so giving it the furnace’s 5% HP means it should be used a bit more. Next up is the executioner. It used to be super OP, but bug fixes have changed it to a pretty weak card. A buff was important to bring it back up to the meta. Lastly we have the lumberjack which has had like 5 straight buffs. Maybe this time it will work its way into the main game. So that is going to be all for this round of balance changes for April 19th. I’m super excited to see another nerf to elite barbarians, but let me know what you guys think in the comment section down below! Thanks for reading and come back soon for more Clash Royale content. Pingback: Clash Royale Balance Changes Update 4/19 | Clash of Clans Guide, Strategies, Tricks and More! How to rework mortar this time? This’ll be the 2nd time mortar will get reworked, cost 3 elixir? Give a extremely special and powerful ability but increase the elixir to 5? I don’t think royal giant is overpowered actually, elite barbs is definitely the main issue, furnace is definitely over annoying, E wiz is fine for me. But I’m really glad that supercell finally nerf the balloon, I hate it because it’s so annoying. And I think supercell must stop making ‘critical change for skeletal equalisation or there will have no more skeletons. I’m surprised that supercell buff LJ again cause he’s very powerful legendary, although they buffed his weakness, HP. I would like if clash Royale didn’t really buff the lumberjack that much, but instead had some famous youtubers like Molt, Nickatnyte, Chief Pat, or orange juice to advertise the lumberjack and all his capabilities. Maybe even make some decks with him. For example, my friend made a golem deck with lumberjack, he’s level 8, and got almost to Arena 10, so I was VERY impressed. Since he just got a buff, and the skarmy just got one less skeleton, he might just be able to take out a whole skeleton army while being raged, just like in that myth several months ago. I agree! Lumberjack has the possibility to become straight up OP if players can figure him out! Do you have a change of mind how to rank the legendarys now?